I totally remember that from when I was kid! This promotion ran about the same time as Burger King's horrible Italian food options.....chicken parm Burger King style still haunts me! We didn't have a Burger King in my town until several years later so luckily I avoided that mess! that's truly amusing...I have NO memory of this!! You and 100% of the other people I know! Dude! Thank God someone else remember's the McD's chinese food promotional menu! 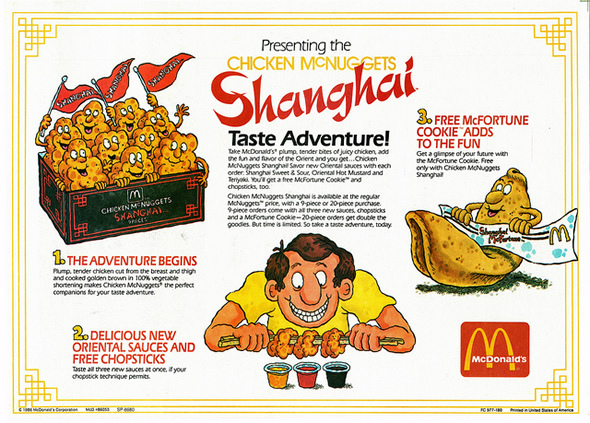 We moved to a new town in '86, and our town's McD's there on the east coast had the chinese menu promo. Thanks for posting! Now I know I was not hallucinating. Keep looking through the site. I eventually found a few pair of chopsticks from McDonalds!